The Daily Show Returns to the UK! 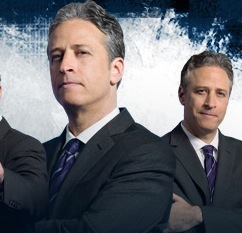 It seems after realising Channel 4 will no longer pay outrageous amounts of cash for ‘The Daily Show with Jon Stewart’, Comedy Central have finally seen sense, and the Emmy Award winning show will be airing nightly on Comedy Central Extra (Sky 128) from the 23rd of July 2012! The Daily Show will air in the UK on Comedy Central Extra (Sky 128) Tuesday to Friday, 24hrs after the US, with the Global Edition airing on Mondays from 23rd of July 2012! ← TV Roundup: Spring/Summer 2012 FAQ! YES YES YES THANK YOU GOD !!!!!! Love the Dailey Show this is awesome news.